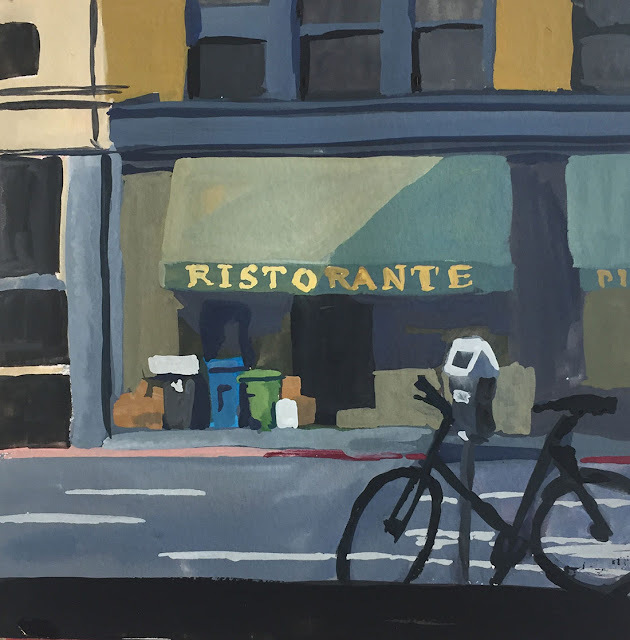 [Guest post by Heather Martin in San Francisco, California] Being the new kid at work is always a little anxiety inducing for me, so for the first week at my new job in early June 2016 in the bustling financial district of San Francisco, I floundered around trying to figure out how to spend my lunch hour. (Being social isn’t my forte). By day I am a mobile game artist, and fortunately work alongside several talented folks. A handful of the most driven artists spent their lunch break drawing and painting, so I decided to tag along with them to fill that hour. It was so incredible to see the amount of dedication and passion they all had. Every day we'd pack up our bags, and head out like a little line of ducklings (surprisingly most of us are five feet or under). 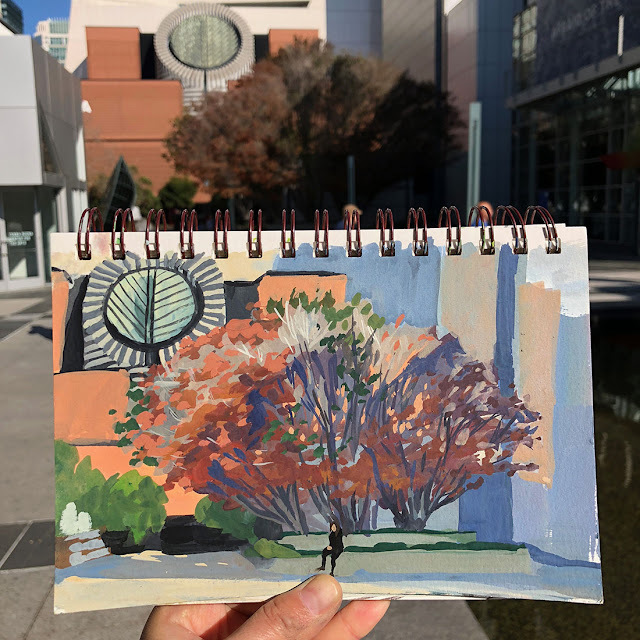 We’d meander our way through the concrete jungle of San Francisco to a randomly chosen spot (usually Yerba Buena Gardens) to sit quietly near each other and draw. This below is the Museum of Modern Art, painted from Yerba Buena Gardens. Something about this daily ritual, and being around these artists, triggered something in me that I had never felt before, even though I have been drawing and painting all my life. I was thrilled to get back into traditional art (most of the past decade I’ve been glued to a computer and Cintiq at various tech companies), and couldn’t wait for the next day’s lunch break. The passion was reignited, and I began seeing everything in a new light. 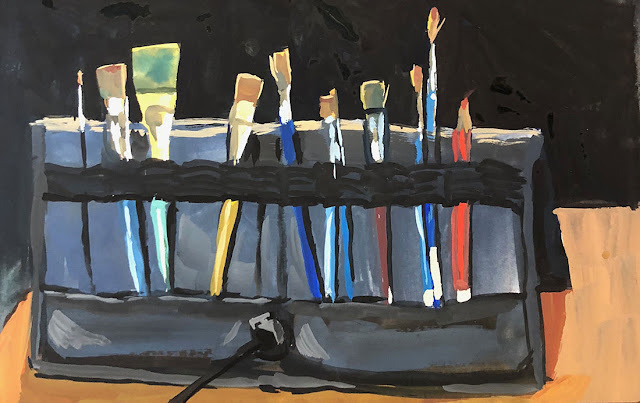 Gouache seemed like a natural choice of mediums, even though I had never used it before: It was a snap to clean up, easy to carry around, and had the opacity and flow that I wanted. It wasn’t all easy-breezy though. I wrestled with probably 100 paintings before I truly got comfortable with the medium and understood its notorious value changes. If you’ve never worked with gouache before, you’ll quickly learn that the value you lay down on the paper is very rarely the value that it ends up drying as. Darks dry lighter, lights dry darker, and if you have layers of paint it will reactivate the under-layers and...yeah. It is a challenge. Over the past year and a half I have obsessively tried many different types of paints, papers, palettes, you name it! I always want to find the perfect setup. Now I have it down to a science, although I am still trying to find something better. This is what I found works best for me. My palette is a Mijello airtight. I love it. If you spray your paints down regularly, it should remain a nice moist consistency for days. I used to shove it into the bottom of my backpack, but learned that it’s better to carry it flat in my hands. If the colors are too wet inside they will bleed into each other and create a pool of mud. 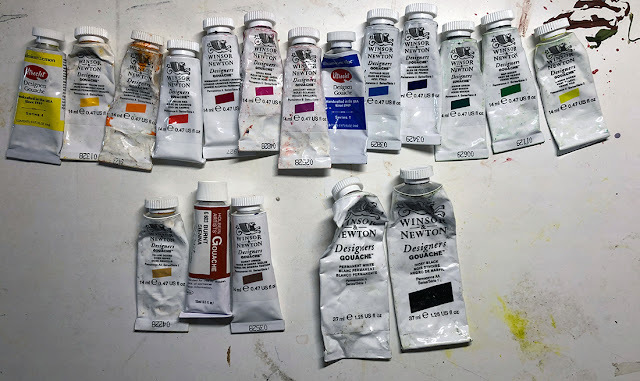 For my paints, I use primarily Winsor & Newton. I find that they re-wet quite well, and a tube goes a long way with really strong pigment compared to other brands. I also like Holbein, and have used Utrecht gouache with success. My brushes are a mixed bag, but for the most part I stick with a 1/4” flat, 1/2” flat, and 3/4” flat and one small round. Sketchbooks are a pretty personal choice, but my favorites are the Cottonwood Arts Recycled Paper Notebook, a beautiful toned ground, and the Strathmore Watercolor Visual Journal. Since the lunch hour is so short, and I have to factor in the time it takes to walk to a place, find a spot, set up, and clean up, I have to be super efficient. 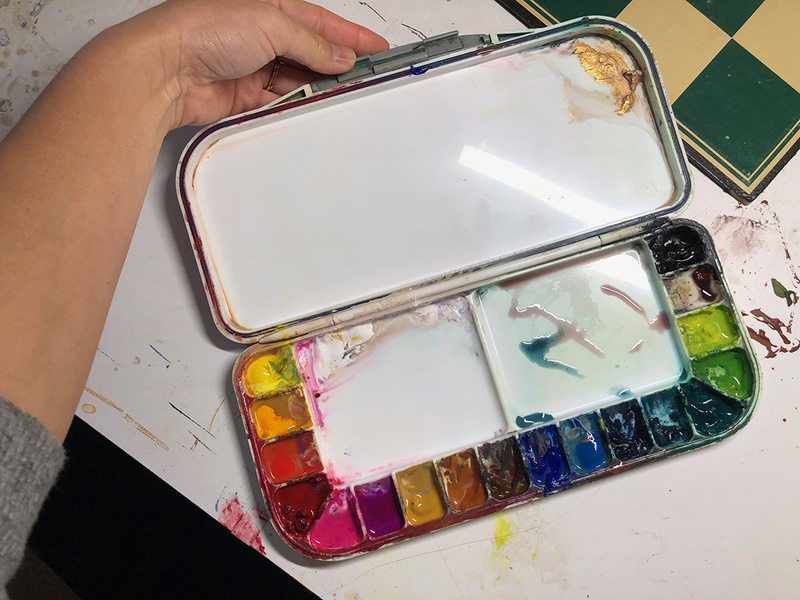 The night before I prepare a fresh water cup for my bag, and I make sure my palette is clean. My backpack is always stocked well with a ridiculously large number of paper towels (I always have some in just about every pocket so I never run out). I set up my stuff the same way every time. 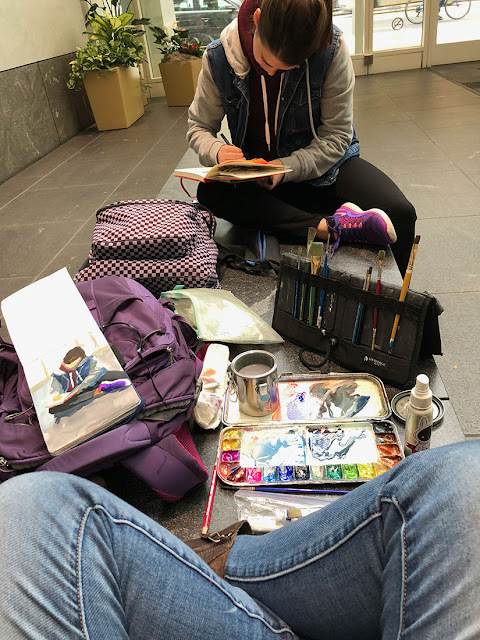 I only carry a sketch pad and supplies, and will sit just about anywhere. It’s nice to not need an easel. I never dilly dally, and rarely chat. Everyone that paints with me has commented on my intense (and let’s face it, frightening) focus. I think we have painted a 360 degree view of every public space within four blocks of work. 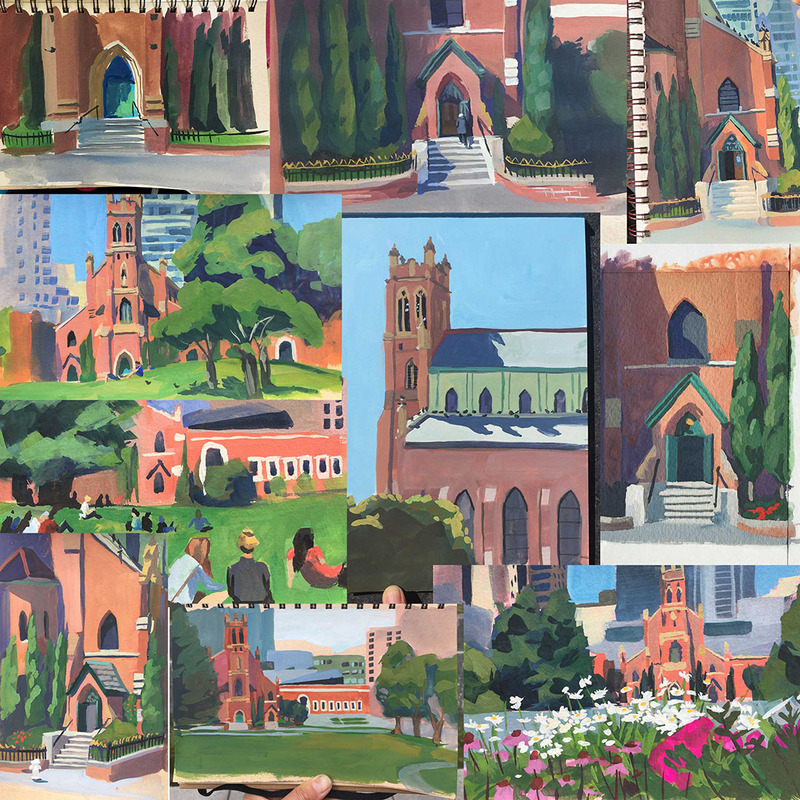 Below you'll see a compilation of some of my St. Patrick's Catholic Church paintings. I think I could paint it blindfolded by now. I keep getting drawn toward it with it's bright reddish orange brick, and teal accents. The building definitely sticks out from the rest of the tall modern skyscrapers that surround it. For a while I was getting bored with it. The church, AGAIN? But then I decided to shift my perspective and find details in different parts of the building that I wanted to capture. I also love if I can tell a story in a painting, like the flock of city pigeons hanging out on the roof are appealing to me. 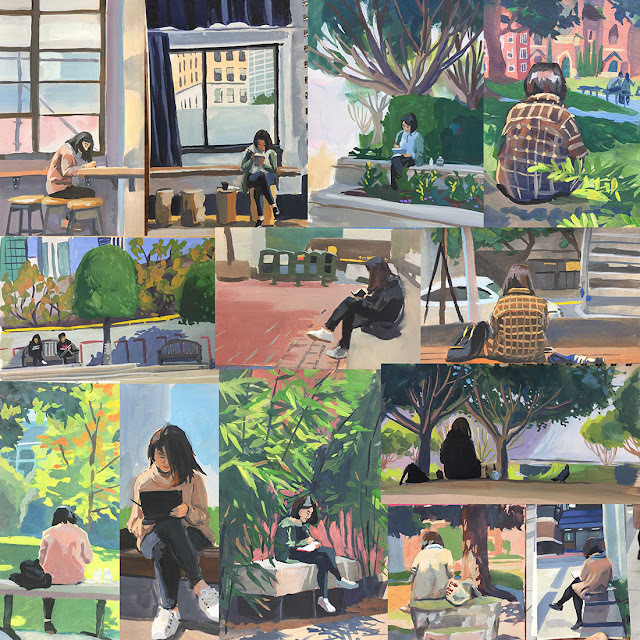 It’s becoming more challenging each day to find something new, so I often paint my coworkers or any people that I think might not move for a while (they almost always do move though). I have a complete series of each of the lunch sketch “regulars”. They’ve become numb to the idea of being the subject of another painting. In turn, I allow them to paint me whenever so it's really fair game if you're in the group. Here are some pieces of my sweet friend Nicole. 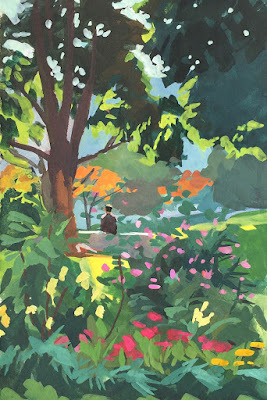 She is an excellent watercolorist and artist. She never complains about always being my “model”. I highly recommend anyone with a day job get into the practice of regular lunchtime sketching. Having very limited time forces you to paint quickly and capture the gesture of the scene. It also forces you to simplify and pick what the most important thing in the scene is for you. I’ve gotten stronger in all aspects of color, value, composition, and technique–all because of this daily speed painting and I have confidence that you will too! Heather Martin is an artist located in the Bay Area of California. Follow her on Instagram to see all of her work, and visit her website for more blog posts and information!